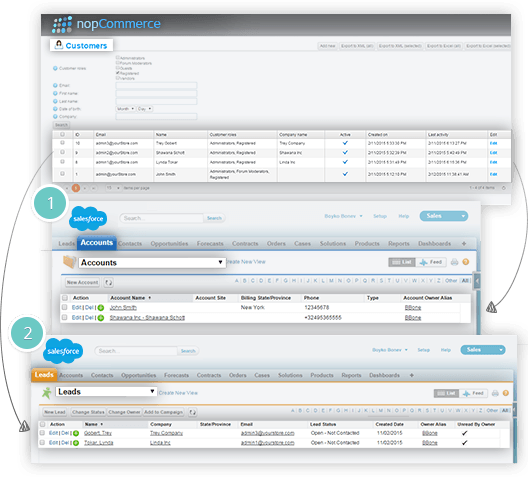 Connect your nopCommerce store with the world's leading Salesforce CRM. 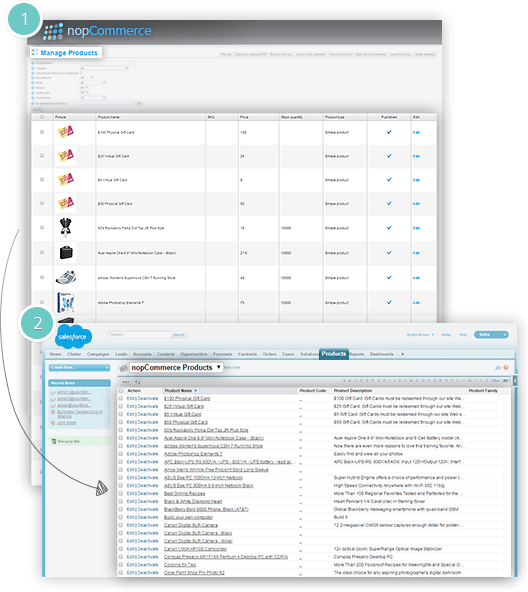 Complete source code is available as an option, should you need to tune it to your own Salesforce customization. 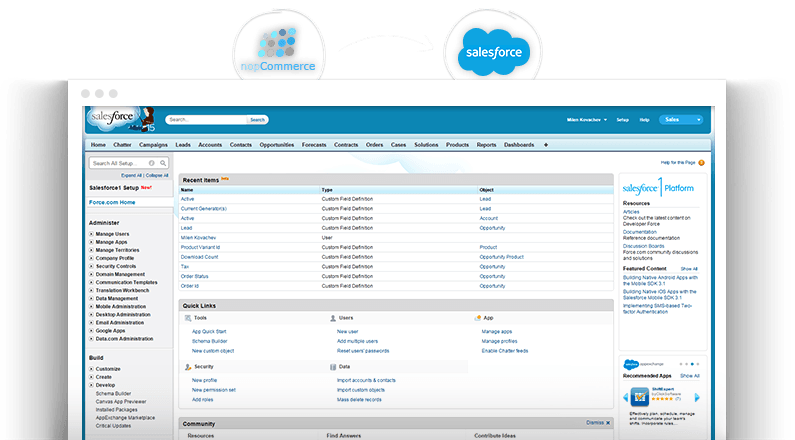 Customers with paid orders are automatically exported from your nopCommerce store to Salesforce as accounts. 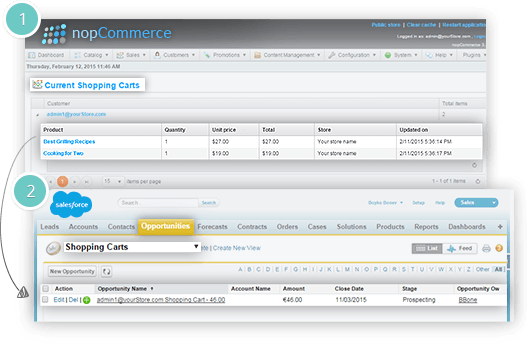 Opportunities registered with your store with no paid orders are automatically exported from your nopCommerce store to Salesforce as leads. are exported to Salesforce as opportunities. are exported to Salesforce under orders. 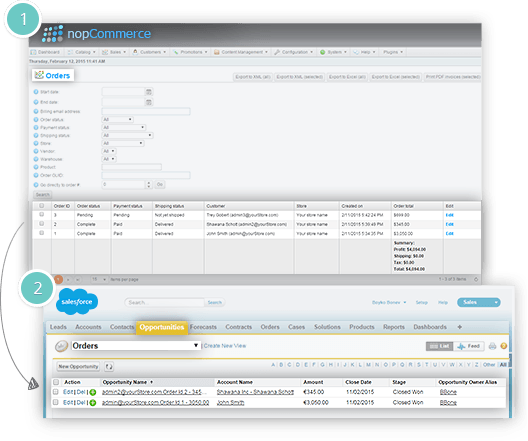 are exported to Salesforce under nopCommerce products. 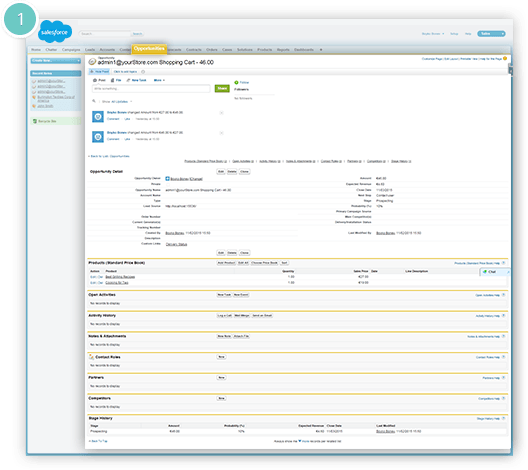 Accounts, leads, orders and opportunities have a detailed information page available in Salesforce. The Nop Ultimate Plugin Collection includes 29 powerful plugins for just a fraction of their price. The collection offers the ultimate functionality for setting up a top rate eCommerce store. We have been working for a number of years on a number of different ecommerce systems before coming across nopcommerce. What compliments the product perfectly is the products and work done by the nop-template.com team. Their products are excellent, well thought out and robust with zero bugs, as well as being incredible value for money. We highly recommend their nopcommerce plugins, if you have nopcommerce it's the best investment you can make. Well done to the nop-templates.com team. Keep up the good work. We look forward to your next offering. Nop-Templates has been a pleasure to work with. They have excellent customer service and fast response times for most questions or alterations of their code. We purchased the plugin bundle and have had no problems with upgrades or request for new functions. They have listened to our suggestions and implemented most of them in a relatively fast amount of time. These are great tools to extend the base nopCommerce platform. Well done! You guys are pretty awesome. Firstly, I rate your customer service and sales team 5 STAR, your turnaround time is 5-7 responses in 24 hour span. And for obvious reasons, your extensions meet the mark of excellence and your integration to the themes is flawless. Undoubtedly I would recommend your products to every customer I come across. Great job guys, keep going. We are a small family owned retail business that uses nopCommerce for our Internet business. We purchased the Ultimate Plugin Package from Nop-Templates and when we had a problem they were fast in response, helpful with novice users and solved the problem. We would use this team again. The product is also most valuable for E-Commerce. If you are in need to a template for nopCommerce, do not hesitate in trying Nop-Templates.com out. Their customer service is exemplary and the quality of their product and ease of implementation, use and configuration was astounding. Yes, their products are paid, not free. BUT, you get MORE than what you pay for, and in today's world, that kind of value is hard to find. I highly recommend. And yes, this is a glowing review for a reason; I truly have faith and satisfaction with the product we purchased. Thank you NOP-Templates.